Power Wheels fuel an expanding hackerspace campaign. Jim Burke wants to spread the gospel of the hackerspace. These workshops stocked with tools and technology are, he believes, the future of community spaces. The literal vehicles for the 25-year-old designer’s campaign are souped-up Power Wheels, those child-size battery-powered Jeeps and Barbie cars. In 2009, Burke found a Power Wheels in a Dumpster. The discovery prompted him to purchase a bunch of the cars from Craigslist. He and his colleagues at the local hackerspace Pumping Station: One (pumping stationone.org), which maintains a large space at 3354 North Elston Avenue, began tinkering with and racing the mini autos. Last year, PS:1 took the contests national, organizing a Power Racing Series in conjunction with Make magazine’s Maker Faires in Kansas City, Missouri, and Detroit. To its Power Wheels racer, a hackerspace from Madison, Sector67, added on-board polarimetry that sent info about the car back to the team’s pit crew. OmniCorpDetroit pimped its ride with a stereo system that blared stuff like Justice and Rick Astley to the audience’s delight. Even the tech tastemakers at Wired took notice with a one-page story in the magazine. For next season, Burke wants to buy better timing and scoring devices and a public-address system, and he plans to double the number of events, including a large summer race in Chicago—but all that requires extra dough. He’s hoping to raise $20,000 through Kickstarter. 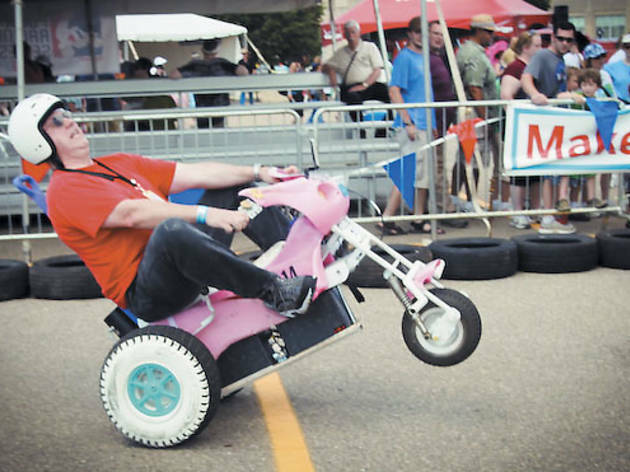 “At each Power Wheels race,” he says, “I’m always amazed by the things people come up with.” For Burke, it’s testament to the pow-pow-power of the hackerspace. 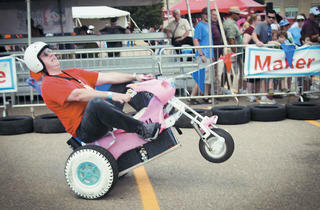 Contribute to the Power Racing Series through October 20 at kck.st/mUuZPk.